Good question. We're probably a lot like you. We're dreamers who started out in businesses very similar to yours and, like you, figured there must be a better way to get things done. So, we created MicroEstimating back in the '80s to find ways to help others in the industry make more money in less time. Like all new things, some of it worked. Some of it failed miserably. We threw some stuff out, fixed some things and built on successes. We're estimating experts, software developers and family people who will never let an accounting firm tell us how to run a business. We like classic rock, medium-rare, and black-and-white movies. We like helping people succeed. The core of Micro's software is its unique and sophisticated engineering components. Complementing this technical strength, the software includes a comprehensive management system. For users, its design is the foundation for achieving greater profitability. By unifying management, design, manufacturing, engineering, purchasing, sales, costing, and accounting, Micro's software creates a continuous improvement circle of profitability. Engineering might be the cost estimating software's core strength - and purchasing professionals and accountants love it, too. Micro Estimating's engineering software for both machining and fabrication encompasses process planning, estimating, bill of materials and ShouldCost estimation analysis. Through Micro's proprietary Machine Tool Emulation technology (MTE) and unique Feature Recognition Estimating incorporating SolidWorks, extremely defined costs are established. The ease of use, and the accuracy of the software has gained the company international recognition as a world leader. Countless major machine tool manufacturers and their distributors rely on MicroEstimating, having verified Micro's ability to accurately calculate true manufacturing times, based on actual equipment and processes. Micro Estimating cost estimating solutions integrate with all major ERP management and accounting systems, providing engineered process planning, True Cost Information (MicroTCI) and robust estimating and quoting functions. American Machinist Magazine presented Micro Estimating with the Excellence in Manufacturing Technology Award for "User Friendliness". 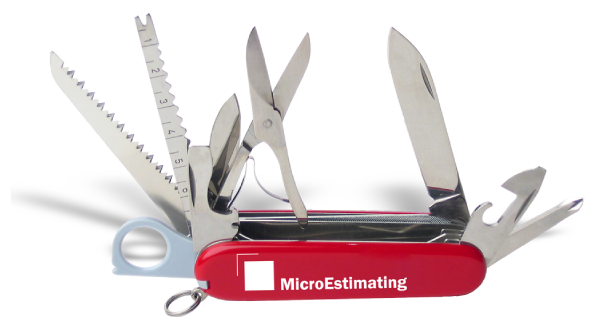 Micro Estimating has 1,000's of loyal customers in the United States and abroad, many of which have been using the software for decades. We'd love to find out about you. Maybe (probably) we can help. Get it all at once. MicroEstimating’s proprietary Machine Tool Emulation technology (MTE) and one-of-a-kind Feature Recognition Estimating with built-in SolidWorks puts the most defined cost analysis at your fingertips. Lightning fast — deadly accurate results are so easily delivered that you’ll probably wonder if something’s missing the first few times you use it. But rest assured, it’s all there. It’s no wonder why the big machine tool manufacturers and distributors rely on MicroEstimating. They’ve put Micro to the test to accurately calculate true manufacturing times based on actual equipment and processes. By unifying management, design, manufacturing, engineering, purchasing, sales, costing, and accounting, Micro's software creates a continuous improvement circle of profitability. Engineering might be the cost estimating software's core strength - but ShouldCost purchasing professionals and accountants love it, too. Micro Estimating cost estimating solutions integrate with all major ERP management and accounting systems, providing engineered process planning, True Cost information, and robust estimating and quoting functions. Too good to be true? We hear that a lot. Schedule a demo and put your new Swiss Army Knife to work today.